At a recent practice, members of the Auckland Regional Drumline from Auckland, New Zealand (the country's only drumline), decided to be adventurous and try out one of 2011's most memorable moments. While we are avid Blue Devils fans, we couldn't miss the opportunity to show off our skills with this great Cavaliers move from their show "XtraordinarY." 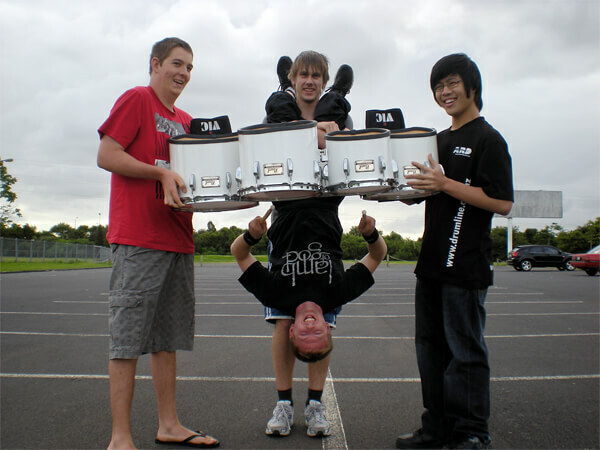 From left to right: Warrick, Oliver, Greg (upside down) and Dominic T.